Whooo! I just finished reading this Michael Pollan's book, named one of the 10 best books in 2006 by the NY Times. And what an excellent read it was. 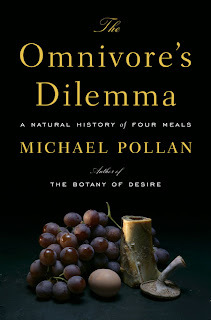 Over the last few weeks I almost missed my subway stop more than a few times on my commute to work because I was too much immersed in learning all about the omnivore's dilemma -- that is, what a modern man is to eat everyday? The concept was as simple as it can be -- what am I going to eat today? What is it that I am eating? Where did it come from? How did it find its way to my plate? The book was divided into three sections: industrial/corn; pastoral/grass; personal/forest. The author traces the footprints of all the food ingredients back to its fundamental roots. Then, in the end, armed with the knowledge of the what, where, and how of the food, he sat down and enjoyed (at least tried to enjoy) the meal.